Alien: Isolation’s apex predator, that two-mouthed berserker freak, isn’t the smartest xenomorph around. Stuck behind an overturned hospital bed while H.R. Giger’s monster paces hungrily around in front of you? Just toss a flare into the opposite corner of the room. The dummy will go crouch over it like a stoned freshman in front of a Lite Brite. The thing is startling when it wrenches open a locker to eat you or when it oozes saliva down from a vent above you, but that’s just because of the raw, animalistic threat it poses. It’s nerve wracking, but not necessarily scary. Fear—real, knuckle-sweat fear—comes not from the alien’s face but the noise it makes. It thumps through the halls, feet falling like a bag of rocks, and in the right moments, you can hear it drooling and hissing in the walls, just waiting for you to walk close enough to grab. Even when the creep isn’t tromping around next to you, whipping out the motion tracker produces a beeping as insistent and troubling as an emergency room heart monitor. When I played Alien: Isolation, confrontations during the game’s middle chapters were exhaustingly tense thanks largely to Creative Assembly’s top-notch sound design. Eventually, though, I got used to it. The fear washed away due in part to the overabundance of sound. There’s just not enough silence among the constant barrage of aural effects, and it’s silence that creates an open field for irrational fear to run free. It’s as vital to horror as rich, ominous sound. Alien: Isolation doesn’t have a great sense of economy in its lush sound design. Everything makes noise, not just the alien. The Sevastopol Space Station hums, save stations beep, and Amanda Ripley, the player character, is a veritable noise fountain. Her shoes squeak when she sneaks around. Her breathing lures the alien in close. What starts as a series of absolutely terrifying sounds in Alien: Isolation dulls as the game drags on past the 10-hour mark. As a hunted animal, the early going is frightening because every thump and hiss is still new, but eventually the noises that used to be scary become a natural part of your habitat. Creative Assembly renders otherwise scary sound design inert by making it both omnipresent and familiar. Alien’s sound design is not a total wash as the game trudges onward, though. One of the more infuriating twists introduced in the final act are facehuggers, an early form of the alien. They glom onto your face, impregnating you with the pupal version of the creature. While they make for an infuriating addition to Isolation—because unlike the fully matured alien, you’re forced to kill them, but the game’s weapons are universally imprecise so dispatching the blighters is a crapshoot—the sounds they bring with them are horrific. When a facehugger leaps onto your face, it’s an instant death, but you’re forced to hear Ripley’s suffocated swallowing as it smothers her. Those moments are some of the worst, most uncomfortable in the whole game, and it’s all thanks to how uncluttered the sound is. There’s no other noise when it happens. Silence surrounds a muffled wet struggle, and all that’s left to do is think about how awful the scene is. The more you think about it, the more awful it gets. Resident Evil is one of horror gaming’s foundational texts and has endured over the years in part because it embraces the sparse sound design that makes those facehugger deaths so harrowing. After the ridiculous artifice of its trappings wash away—particularly the live action intro and the mind boggling acting—you’re left with a game that creates a surprisingly thick atmosphere for scares. There is a discomforting dissonance born out of seeing these primitive 3-D characters walking around detailed pre-rendered backgrounds, but that’s not what makes Resident Evil so scary after this many years. It’s how damn quiet the whole thing is. Resident Evil surrounds you with an unnatural empty aural space. From the very start, there’s emptiness that otherwise wouldn’t exist. 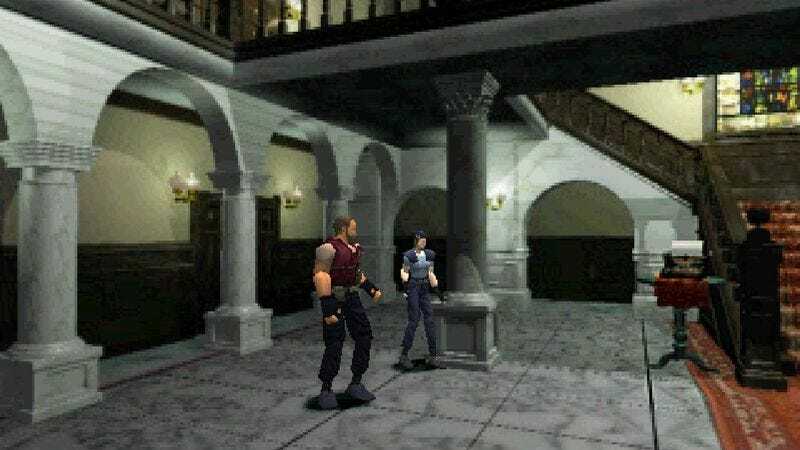 When Jill, Wesker, and Barry Burton enter the Arkley mansion, their dialogue sounds wrong for the size of the foyer. There’s an appropriate echo on top of their words but dead air when their stilted sentences end. Horror movies and games often plug in a low frequency tone into scenes like this, trying to replicate the never-quite-silent sound of a quiet room. There’s none of that here, and the whole scene is made phantasmagorical because of it. Forget the appearance of the monsters that chased them inside; this place literally doesn’t sound right. Whether or not the silent atmosphere in the original Resident Evil is an artifact of technological limitations is beside the point. It works. When Jill walks through a room and there’s nothing but the sound of her combat boots on marble. It’s an impenetrable silence that makes every step sound dreamlike and gigantic. The silence is also only used sparingly. If the whole game were that quiet, it would be exhausting and deadening, the same familiarizing effect that takes the teeth out of Alien: Isolation. Instead, Resident Evil uses almost every sound trick in the horror playbook to make those regular moments of agonizing stillness effective throughout. Ambient music that shifts from ominous in active scenes—like when that dog famously jumps through the window—to tranquil in quiet safe rooms. When the silence comes back, it’s all the more bothersome and strange. Alien: Isolation tosses out any semblance of balance, especially in its back half, opting instead to try and overwhelm you with a constant barrage of audio-visual loudness. Everything’s on fire, exploding, hissing, or yelling—including Ripley. Even those killer facehugger sounds lose their vicious power because of how easy it is to get stuck in a loop where you’re killed by them over and over. Alien wouldn’t necessarily be better if it stretched its quieting effects into the rest of the game. It would have to be a fundamentally different beast; survival depends on relative cacophony during its best bits. At the very least, though, it may have found some longevity with more variety, expanding on the terrible hush of those facehugger deaths (not to mention making them a little less frequent and easier to avoid.) Efficient and balanced use of silence has helped make a technologically antiquated game like Resident Evil resilient over years. After all, monsters don’t live in the real world. They live in the space left open when our minds have nothing to do but fill in the gaps.